“My Very Educated Mother…..” Ah I forget the rest. This is a set of eight light weight plates that have been designed to look like each planet in our solar system. The plates come in a set and include Mecury, Venus, Earth, Mars, Jupiter, Saturn, Uranus and Neptune (Pluto is not a planet). They are really going to help kids better familiarize with the planets and what each one looks like. The plates are all of the same size (10 inch in diameter). It probably won’t be a good idea to make the plates different sizes in proportion to the sizes of the real planets because the plates were designed for use as a regular dinner plate not for decorative purposes, and smaller plates would mean smaller portions which may not fit well in some families. The plates are made of Melamine, a hard material used in most dinnerware. The makers have instructed not to use the plates in a microwave or in a dishwasher and should be washed by hand only. 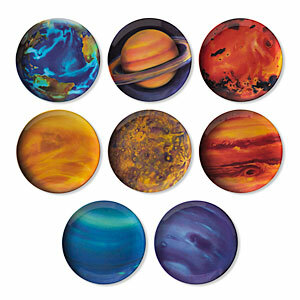 “Planetary Plates” as they are called is a product of ThinkGeek and is available on their website for $36.99 a set.